"I saw life; I thought about death"
Coming to a book like this relatively late – when I’ve seen so much said about it, in so many places – makes me wonder: how will I react to it? For this surely isn’t a book to inspire indifference. If you don’t know the background, Karl Ove Knausgaard has become something of a phenomenon in his native Norway for My Struggle, a six-volume sequence of… novels? memoirs? something else? which draws on his life in immense and (on the evidence of this first volume, anyway) uncompromising detail. A Death in the Family (the UK editions of the My Struggle books have been given individual titles) begins with a meditation on death which is one of the most affecting passages of writing that I’ve read in months. Why, Knausgaard asks, do we try to conceal the reality of death from ourselves, when we know that it’s an inevitable part of life? Slightly less than half of the book is then given over to an account of events in (mostly) the author teenage years. 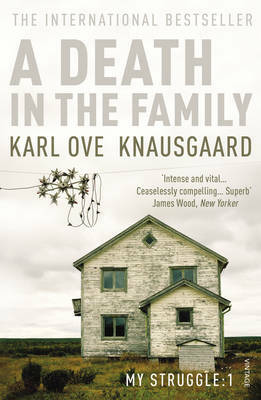 The second half focuses mainly on how Knausgaard reacted to his father’s sudden death. Immediately after this, Knausgaard returns to more prosaic activity: microwaving a meal, washing, fetching cutlery, eating. Earlier in A Death in the Family, he talks about yearning ‘to write something exceptional one day’ (p. 28), and feeling thwarted in that ambition by the day-to-day business of life. And we see this manifest in the form of the book: Knausgaard will spend pages on the minutiae of events, but moments like his experience of art are rather fewer and further between. We feel the weight of all that detail bearing down on the author’s ability to express his innermost feelings. This is not confined to Knausgaard’s encounters with art. One of the most powerful sequences in the book for me is when Karl Ove and his brother view their father’s body in a chapel, while a gardener mows the lawn outside. Knausgaard registers great detail about the body (of course), but is as aware of the noisy lawnmower as he is of his response to what he’s doing. The fact of his father’s death has no more significance in that situation than does a spot of gardening. At the back of all this is the issue of memory. We are reminded several times that human memory is fallible; so just how are we to take all this information we are given about Knasgaard’s life – information that creates a pictures more vivid at times than our own lived experience? Perhaps we can see it as an expression of the mix of knowable and unknowable that his father’s life is to Knausgaard; Karl Ove has seen so much, but cannot know how the father he once looked up to became a man who drank himself to an early death. Here, the everyday becomes interchangeable with the depths of existence; only by writing about one, it seems, could Knausgaard find a way to address the other. I wasn’t sure if I wanted to read this, but have decided to jump in at Book Three since it recollects his childhood, living with the minutiae of life and how its necessities become like weeds strangling the desire for artistic expression is exhausting enough in one’s own life, let alone six volumes of someone elses. However, for a few beautiful phrases, perhaps it is still worth it, though it prolongs the procrastination of doing our our thing. Beautiful and appreciative review David. Nice review. I’m glad you picked up the point on the accuracy of his recollections, as I was wondering about that. As I read the paragraph about mowing the lawn I thought, how can he recall that with such clarity, how can we trust that recollection, so I’m glad that’s part of the theme. One point nobody seems to address, the title seems a reference to Mein Kampf, which is a slightly odd thing to refer to. Is there a reason he picked such a resonant (if that’s the right term) title? Hi Max. All I remember hearing about the title (I can’t find the link now) was that Knausgaard felt that My Struggle (‘Min kamp’ in Norwegian) encapsulated what he was writing/writing about, and that his publishers weren’t too keen on the idea (though of course he got his way in the end). Why exactly he wanted to make that reference, though, I don’t know. Great review, David. This is another book (along with ‘The Sorrows of Angels’) where I had to dive in at number two in a series for our IFFP shadowing. I found ‘A Man in Love’ very compelling indeed, probably because Knausgaard pours so much of his own essence and existence into the book. ‘A Death in the Family’ is quite high on my tbr, so I hope to get to it soon!